^ 邱創煥. 公忠體國、勤政愛民的孫前院長. 傳記文學. 2006年5月, 88 (5): 45–49. ISSN 1234-5679. ^ 5.0 5.1 林蘭芳. 戰後初期資源委員會對台電之接收(1945-1952) ─以技術與人才為中心 (pdf). 中央研究院近代史研究所集刊. 2013年3月, (79): 89–135. ISSN 0578-2015. ^ Architect of Taiwan's industrial revolution. Smart Grid. 2006-02-25 [2010-04-28] （英语）. 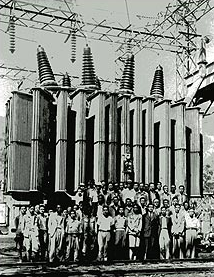 From 1946 to 1964 Sun worked for Taiwan's electric utility, rising from senior engineer to president. He then worked for three years as chief executive officer and general manager of the Electricity Corporation of Nigeria, shortly after the African country became independent. ^ 魏鏞. 方案內閣前瞻領導. 《遠見雜誌》1994年1月號第091期. [2016-05-03]. ^ 17.0 17.1 李登輝、國史館. 見證台灣：蔣經國與我. 允晨文化. 2004年5月13日. ISBN 9570329793 （中文（台灣）‎）. ^ 周玉蔻. 編造蔣經國接班人. 自由時報. 2006-02-16. （原始内容存档于2013-04-19）. ^ 孫運璿家屬 未被要求提前搬離。. 大紀元、自由時報. 2006-03-18.